I am writing this, my dear Bertie, at a little table which has been fitted up in the window of my bedroom. Every one in the house is asleep except myself; and all the noise of the city is hushed. Yet my own brain is singularly active, and I feel that I am better employed in sitting up and writing to you, than in tossing about upon my bed. I am often accused of being sleepy in the daytime, but every now and then Nature gets level by making me abnormally wakeful at night. Are you conscious of the restful influence which the stars exert? To me they are the most soothing things in Nature. I am proud to say that I don’t know the name of one of them. The glamour and romance would pass away from them if they were all classified and ticketed in one’s brain. But when a man is hot and flurried, and full of his own little ruffled dignities and infinitesimal misfortunes, then a star bath is the finest thing in the world. They are so big, and so serene and so lovely. They tell me that the interplanetary spaces are full of the debris of shattered asteroids; so, perhaps, even among them there are such things as disease and death. Yet just to look at them must remind a man of what a bacillus of a thing he is—the whole human race like some sprinkling of impalpable powder upon the surface of one of the most insignificant fly-wheels of a monstrous machine. But there’s order in it, Bertie, there’s order! And where there is order there must be mind, and where there is mind there must be sense of Justice. I don’t allow that there can be any doubt as to the existence of that central Mind, or as to the possession by it of certain attributes. The stars help me to realise these. It is strange, when one looks upon them, to think that the Churches are still squabbling down here over such questions as whether the Almighty is most gratified by our emptying a tea-spoonful of water over our babies’ heads, or by our waiting a few years and then plunging them bodily into a tank. It would be comic if it were not so tragic. This train of thought is the after-swell from an argument with Cullingworth this evening. He holds that the human race is deteriorating mentally and morally. He calls out at the grossness which confounds the Creator with a young Jewish Philosopher. I tried to show him that this is no proof of degeneration, since the Jewish Philosopher at least represented a moral idea, and was therefore on an infinitely higher plane than the sensual divinities of the ancients. His own views of the Creator seem to me to be a more evident degeneration. He declares that looking round at Nature he can see nothing but ruthlessness and brutality. “Either the Creator is not all-powerful, or else He is not all-good,” says he. “Either He can stop these atrocities and won’t, in which case He is not all-good; or else He would stop them but can’t, in which case He is not all-powerful.” It was a difficult dilemma for a man who professes to stick to reason to get out of. Of course, if you plead faith, you can always slip out of anything. I was forced to get behind a corner of that buckler with which you have so often turned my own thrusts. I said that the dilemma arose from our taking it for granted that that which seemed evil really was EVIL. “It lies with you to prove that it isn’t,” said he. “We may hope that it isn’t,” said I. “Wait until some one tells you that you have cancer of the pyloric end of the stomach,” said he; and he shouted it out again every time I tried to renew the argument. But in all soberness, I really do think, Bertie, that very much which seems to be saddest in life might be very different if we could focus it properly. I tried to give you my views about this in the case of drink and immorality. But physically, I fancy that it applies more obviously than it does morally. All the physical evils of life seem to culminate in death; and yet death, as I have seen it, has not been a painful or terrible process. In many cases, a man dies without having incurred nearly as much pain, during the whole of his fatal illness, as would have arisen from a whitlow or an abscess of the jaw. And it is often those deaths which seem most terrible to the onlooker, which are least so to the sufferer. When a man is overtaken by an express and shivered into fragments, or when he drops from a fourth-floor window and is smashed into a bag of splinters, the unfortunate spectators are convulsed with horror, and find a text for pessimistic views about the Providence which allows such things to be. And yet, it is very doubtful whether the deceased, could his tongue be loosened, would remember anything at all about the matter. We know, as students of medicine, that though pain is usually associated with cancers and with abdominal complaints; still, in the various fevers, in apoplexy, in blood poisonings, in lung diseases, and, in short, in the greater proportion of serious maladies, there is little suffering. I remember how struck I was when first I saw the actual cautery applied in a case of spinal disease. The white hot iron was pressed firmly into the patient’s back, without the use of any anaesthetic, and what with the sight and the nauseating smell of burned flesh I felt faint and ill. Yet, to my astonishment, the patient never flinched nor moved a muscle of his face, and on my inquiring afterwards, he assured me that the proceeding was absolutely painless, a remark which was corroborated by the surgeon. “The nerves are so completely and instantaneously destroyed,” he explained, “that they have no time to convey a painful impression.” But then if this be so, what becomes of all the martyrs at the stake, and the victims of Red Indians, and other poor folk over whose sufferings and constancy we have wondered? It may be that Providence is not only not cruel itself, but will not allow man to be cruel either. Do your worst, and it will step in with a “No, I won’t allow this poor child of mine to be hurt”; and then comes the dulling of the nerve and the lethargy which takes the victim out of the reach of the tormentor. David Livingstone under the claws of the lion must have looked like an object lesson of the evil side of things, and yet he has left it upon record that his own sensations were pleasurable rather than otherwise. I am well convinced that if the newly-born infant and the man who had just died could compare their experiences, the former would have proved to be the sufferer. It is not for nothing that the first thing the newcomer into this planet does is to open its toothless mouth and protest energetically against fate. Cullingworth has written a parable which makes a paragraph for our wonderful new weekly paper. We are at one, he and I, in thinking that the infinite is beyond our perception. We differ only in that he sees evil and I see good in the working of the universe. Ah, what a mystery it all is! Let us be honest and humble and think kindly of each other. There’s a line of stars all winking at me over the opposite roof—winking slyly at the silly little person with the pen and paper who is so earnest about what he can never understand. Well, now, I’ll come back to something practical. It is nearly a month since I wrote to you last. The date is impressed upon my memory because it was the day after Cullingworth shot the air-dart into my finger. The place festered and prevented my writing to any one for a week or two, but it is all right again now. I have ever so much of different sorts to tell you, but really when I come to think of it, it does not amount to very much after all. First of all, about the practice. I told you that I was to have a room immediately opposite to Cullingworth’s, and that all the surgical cases were to be turned over to me. For a few days I had nothing to do, except to listen to him romping and scuffling with his patients, or making speeches to them from the top of the stairs. However, a great “Dr. 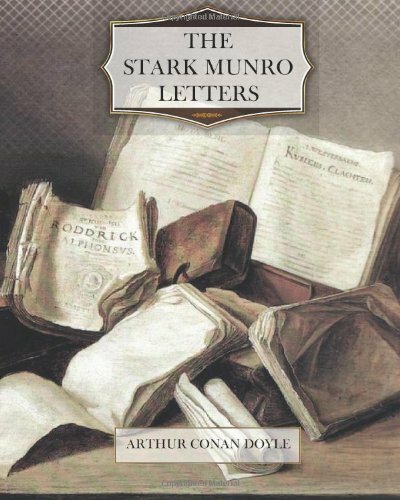 Stark Munro, Surgeon,” has been affixed to the side of the door downstairs, opposite Cullingworth’s plate; and a proud man was I when first my eyes lit upon it. On the fourth day, however, in came a case. He little knew that he was the first that I had ever had all to myself in my life. Perhaps he would not have looked quite so cheerful if he had realised it. Poor chap, he had little enough to be cheery over either. He was an old soldier who had lost a good many teeth, but who had continued to find room between his nose and chin for a short black clay pipe. Lately there appeared a small sore on his nose which had spread, and become crusted. On feeling it I found it as hard as a streak of glue, with constant darting pains passing through it. Of course, there could be no question as to diagnosis. It was epitheliomatous cancer, caused by the irritation of the hot tobacco smoke. I sent him back to his village, and two days after I drove over in Cullingworth’s dog-cart, and removed the growth. I only got a sovereign for it. But it may be a nucleus for cases. The old fellow did most admirably, and he has just been in (with a most aristocratic curl to his nostrils) to tell me that he has bought a box full of churchwardens. It was my first operation, and I daresay I was more nervous about it than my patient, but the result has given me confidence. I have fully made up my mind to let nothing pass me. Come what may, I am prepared to do it. Why should a man wait? Of course, I know that many men do; but surely one’s nerve is more likely to be strong and one’s knowledge fresh now than in twenty years. Cases came dribbling in from day to day—all very poor people, and able to pay very poor fees—but still most welcome to me. The first week I took (including that operation fee) one pound seventeen and sixpence. The second, I got two pounds exactly. The third, I had two pounds five, and now I find that this last week has brought in two pounds eighteen; so I am moving in the right direction. Of course, it compares absurdly enough with Cullingworth’s twenty pound a day, and my little quiet back-water seems a strange contrast to the noisy stream which pours for ever through his room. Still, I am quite satisfied, and I have no doubt at all that his original estimate of three hundred pounds for the first year will be amply justified. It would be a pleasant thing to think that if anything were really to happen at home, I should be able to be of some use to them. If things go on as they have begun, I shall soon have my feet firmly planted. I was compelled, by the way, to forego an opening which a few months ago would have been the very summit of my ambition. You must know (possibly I told you), that immediately after I passed, I put my name down as a candidate for a surgeonship on the books of several of the big steamship lines. It was done as a forlorn hope, for a man has usually to wait several years before his turn comes round. Well, just a week after I started here, I got a telegram one night from Liverpool: “Join the Decia to-morrow as surgeon, not later than eight in the evening.” It was from Staunton & Merivale, the famous South American firm, and the Decia is a fine 6000-ton passenger boat, doing the round journey by Bahia and Buenos Ayres to Rio and Valparaiso. I had a bad quarter of an hour, I can tell you. I don’t think I was ever so undecided about anything in my life. Cullingworth was dead against my going, and his influence carried the day. When I laughed at his ideas of modern sea-going he tried another line. And so it ended by my letting them have a wire to say that I could not come. It is strange when you come to a point where the road of your life obviously divides, and you take one turning or the other after vainly trying to be sure about the finger-post. I think after all I chose rightly. A ship’s surgeon must remain a ship’s surgeon, while here there is no horizon to my possibilities. As to old Cullingworth, he is booming along as merrily as ever. You say in your last, that what you cannot understand is how he got his hold of the public in so short a time. That is just the point which I have found it hard to get light upon. He told me that after his first coming he had not a patient for a month, and that he was so disheartened that he very nearly made a moonlight exodus. At last, however, a few cases came his way—and he made such extraordinary cures of them, or else impressed them so by his eccentricity, that they would do nothing but talk of him. Some of his wonderful results got into the local press, though, after my Avonmouth experience, I should not like to guarantee that he did not himself convey them there. He showed me an almanac, which had a great circulation in the district. Aug. 15. Reform Bill passed 1867. Aug. 16. Birth of Julius Caesar. Aug. 17. Extraordinary cure by Dr. Cullingworth of a case of dropsy in Bradfield, 1881. Aug. 18. Battle of Gravelotte, 1870.